These units are high grade pulse laser processing units suited to high speed welding of metal parts and high speed cutting of thin sheet metal. The body, which incorporates a cooler, is packed with features. The LCD touch screen panel allowing simple operations, the interactive software and the various energy control functions all combine to control heat warping and minimize welding defects. 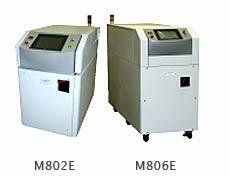 There are four types: the M802E (200W), the M803E (300W), the M806E (600W: the standard type) and the M806E-C (600W: the precision processing type which can use 300μm fibers). The Laserservers come with various options including an energy super-stabilizer and network monitoring, making them user friendly units. 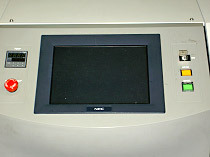 The touch screen panel and interactive software make operating the unit a breeze. Servers synchronized via a corporate LAN can now bring together control operations. Lightning fast, precise responses are now possible no matter what the time. Ave. power M802E Max 200W ave.